Never before has the need for corporate team building been any greater than today, where we are living in a world so consumed by fast moving technology and high company targets that we seem to have lost the camaraderie of the office. It starts from our daily commute in the morning, where we find ourselves pressed up against perhaps another 10 people on the tube, all the while staring into the screen of our iPhone, checking the news (bad news) and guessing who will be off work today through the previous nights’ social media posts. We then enter our workplace, ready to start the day and get the head down (so to speak) to make sure we reach those high company targets and keep our bosses in the style they have become accustomed. But are we still aware of those around us or are we too focused within our own little bubbles? We haven’t forgotten our co-workers. We still socialise with them, just in a different way. We now learn about their lives and families through social media which is fine in itself but do we still find ourselves yearning for contact with our colleagues in a more physical sense? Of course we do. Because this is what makes us understand that we are all the same, we are all in this for the same reasons. To have a better life. But short of that couple of pints in the pub after work, what activity can you offer your team which will bring them together and help them get some release from the pressures of work? In a word – Paintball! Because really, there’s no better way to build a healthy rapport with your colleagues than to get down and dirty and work up that competitive spirit out on the field. 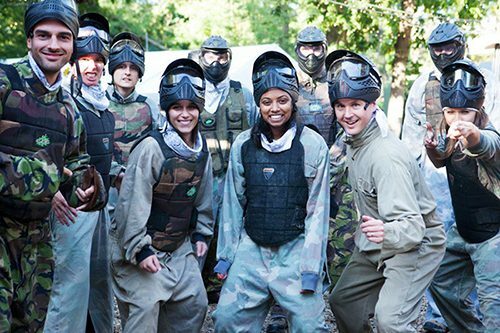 Paintball in London is now listed as one of the top activities for corporate days out and in the past few years has got more and more companies jumping on board. Whether you’re a man or woman, tall, small or whatever size or shape you are, the playing field is level so anyone can take part and join in the fun. Campaign Outdoor Activity Centre in Surrey offer a fantastic corporate day out package labelled ‘From the Boardroom to the Battlefield’ and they cater for companies large or small with events to suit all budgets. Located just 25 minutes from southwest London, the venue has great transport links, boasting just 1 mile from J10 of the M25 and 5 minutes’ walk from main line rail links from London. 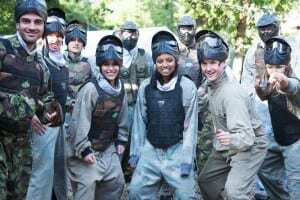 They can put together a package that works around your needs, be it Paintball, Laser Tag or a multi-activity event designed just for you. Whether you are there for a few hours or the whole day. So if you need a day’s stress busting or an end of year get together, look no further than Campaign to motivate and energise your team.